Radiation dose to organs of 100 adult patients undergoing lumbar spine (LS) radiography at a University Hospital have been assessed. Free in air kerma measurement using an ionization chamber was used for the patient dosimetry. Organ and effective dose to the patients were estimated using PCXMC (version 1.5) software. The organs that recorded significant dose due to LS radiography were lungs, stomach, liver, adrenals, kidney, pancreas, spleen, galbladder, and the heart. It was observed that the stomach recorded the highest dose (48.2 ± 1.2 μGy) for LS anteroposterior (AP). The spleen also recorded the highest dose (41.2 ± 0.5 μGy) for LS lateral (LAT). The mean entrance surface air kerma (ESAK) of LS LAT (122.2 μGy) was approximately twice that of LS AP (76.3 μGy), but the effective dose for both examinations were approximately the same (LS LAT = 8.6 μSv and LS AP = 10.4 μSv). The overall stochastic health effect of radiation to patients due to LS radiography in the University Hospital is independent of the projection of the examination (AP or LAT). Conventional X-ray diagnosis is a significant source of radiation exposure among the population. Therefore, there is the need for X-ray examinations to be conducted using techniques that keep the patients' exposure as low as possible, but does not compromise on image quality. To be able to keep doses as low as reasonable achievable, it is necessary to understand the factors that influence patient doses and image quality. The Basic Safety Standard (BSS)  recommends optimization procedures in radiology for guidance. In the optimization of X-ray examination techniques, the patient dose should be characterized by a quantity that better accounts for radiation risk. Knowledge of organ and effective dose are necessary if the risk of radiation exposure is of concern. Patient dosimetry in radiological examination is necessary due to evolving diagnostic techniques. It is important to provide information on patient doses to all relevant stakeholders for continuous optimization. This study estimated radiation dose to organs of patients during LS radiography by using PCXMC, a PC based Monte Carlo program that calculates organ doses in medical X-ray examinations. This study was carried out at a University Hospital using a Philips X-ray machine with serial number 982527 and model number 989000085271 with total inherent filtration of 2.5 mm Al. The radiographic image was processed using a cassette (18 × 43 cm) with a screen-film combination. In all, 100 adult patients undergoing LS radiography were randomly selected for the study. The examinations were performed by a qualified radiographer and the image quality of the exposures was passed by a consultant radiologist at the University Hospital. In order to check for consistent performance of the X-ray machine, quality control assessments were performed. The output reproducibility of the X-ray machine was checked with a RAD-CHECK PLUS (CE Inovision, Nuclear Associates Div. of Victoreen, Inc., USA). Compliance of the radiation output linearity was checked with acceptance criteria of ≤0.1. The accuracy, reproducibility of the X-ray tube voltage, and timer were measured with a RMI model 240A (Gammex RMI, Inc., Middleton, WI) using the standard procedure as given in the Physics of Medical Imaging. The X-ray field and light beam alignment was checked by exposing a light demarcated area on a film for agreement with the radiation. Free in air measurements with RAD-CHECK PLUS (CE Inovision, Nuclear Associates Div. of Victoreen, Inc., USA) placed at 100 cm from the focal spot of the X-ray tube were made, an alternative to thermoluminescence dosimeter (TLD) or any other direct measuring device. Free-in-air measurements of radiation were recorded varying tube voltage (kV) and current-time product (mAs) combinations to cover a meaningful range available on the Philips X-ray machine. The recorded output measurements in millirontgen (mR) were converted to milligray (mGy) (1 mR is equivalent to 8.73 μGy in air for X-ray or gamma ray) and divided by the mAs to obtain the output ratio (mGy/mAs). The output ratio (mGy/mAs) was plotted against kV to obtain an IAK curve  as shown in [Figure 1]. Introducing different thickness of aluminum sheets in the direction of the radiation beam, and using RAD-CHECK PLUS (CE Inovision, Nuclear Associates Div. of Victoreen, Inc., USA) to measure the penetrated radiation, half value layer (HVL) of 70-120 kVp were estimated as shown in [Figure 2]. Using [Figure 2], the HVL of any operating voltage of the X-ray tube at the University Hospital could be estimated. Further, using the obtained HVL of the tube voltage on a reference table for high frequency direct current, 3 phase, 12 and 6 pulse generator, total filtration of the X-ray tube was extrapolated. PCXMC requires the input of IAK because it provides the BSF taking into consideration the tube voltage (patient thickness related), HVL, beam filtration, and the field size (patient thickness related: PCXMC calculates the field size on top of the patient based on the cassette size, FFD, patients' weight and height) as given in Petoussi-Henss et al. In order to generate the required X-ray spectrum for the simulation, PCXMC requires the user to input the filter material and thickness, tube voltage, and anode angle. The program mimics the procedure at the hospital for easy organ dosimetry. The X-ray machine at the University Hospital was observed to be performing self consistently when the quality control results were compared with the radiation regulatory requirements of Ghana  as shown in [Table 1]. The examinations considered for this study were procedures where both LS projections (anteroposterior (AP) and lateral (LAT)) were performed on one patient. The average patient height and weight were observed to be 171.1 (159-181) cm and 80.9 (50-120) kg, respectively. A 100 cm FFD was also observed for both LS AP and LS LAT. It was also observed that the University hospital uses the same X-ray field size for both LSAP and LS LAT per patient collimation. The total filtration of the X-ray machine was found to be in the range of 1.8-2.8 mm Al for the peak tube voltage range for both LS AP and LAT. The radiation field area on top of the patients were recorded to be in the range of 580.64 (38.1 × 15.24)-767.74 (43.18 × 17.78) cm 2 . [Table 2] shows the exposure parameters for both LS projections and the mean ESAK and effective dose. The kVp used for LS LAT examination is greater than that of LS AP by approximately a factor of 1.2 as evidenced in [Table 2]. The mAs for LS LAT examination was observed to be greater than that of LS AP examination by approximately a factor of 1.1. There were variations in the kVp and mAs due to the randomly selected patients with varying weight and height. The ESAK for LS LAT examination was almost twice that of LS AP examination. This is due to the high kVp used for LS LAT examinations because of increased attenuation in the LAT region of the body. The difference in effective dose of both LS projections was insignificant, although a significant difference was observed in the ESAK. From the results of effective dose presented in [Table 2], indicates that the overall radiation health effect on patients due to LS radiography is independent of the projection (AP or LAT) of the radiation beam. However, the same cannot be said for the equivalent doses to patient organs due to the two LS radiography projections as shown in [Table 3]. Organs recording high doses in this study have been presented in [Table 3]. 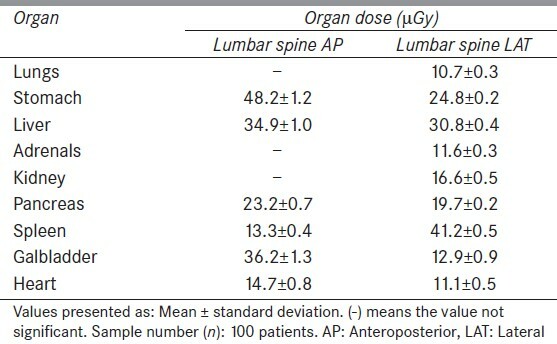 The organ doses varied for both LS AP and LAT radiography due to the position of these organs with respect to the orientation of the incident radiation beam on the patient. However, it was observed that dose to the pancreas and the liver recorded approximately equal values for both LS radiography projections. This is due to the anatomical position of these organs with respect to the patients' orientation to the radiation beam. The stomach and the spleen recorded the highest organ dose for LS AP and LAT radiography, respectively. It is expected that had the International Commission on Radiological Protection (ICRP) 103 recommended tissue weighting factors  been used in the organ dose estimation, the dose to the adrenals, kidney, pancreas, spleen, and heart would have been higher than as reported in this study by fractions of factor 2.4. It is also expected that the dose to the liver and the galbladder will be lower than as reported in this study by a factor of 0.8. However, the dose to the lungs and the stomach is expected to remain unchanged. The ESAK obtained for this study was compared with other studies in [Table 4]. It can be seen that the ESAK recorded for both LS radiography projections in this study were lower than what was recorded in the other studies. ,, This could be attributed to one or a combination of the following: The number of X-ray rooms considered for the study; the mode of X-ray output estimation; and the difference in the X-ray output of different X-ray tube manufactures. However, the ESAK recorded for LS LAT examination was approximately twice that of LS AP examination in this study. The same observation was also found from the studies of Muhogora et al.,  and Hart et al. This in our view makes this study consistent with the findings of the other studies. Organ doses due to LS radiography have been assessed using a Monte Carlo base program PCXMC (version 1.5). It was found that the stomach and spleen of patients undergoing LS radiography AP and LAT received the highest dose, respectively. There was no significant difference between the effective dose to patients for both LS radiography projections in the hospital. This suggests that for LS radiography, the overall stochastic health effect of radiation to patients is independent of the projection of the examination (AP or LAT) in the University hospital. 1. International Commission on Radiological Protection. Radiological Protection in Medicine. Ann. ICRP 37(5). New York: ICRP; 2007.p. 105. 2. International Atomic Energy Agency. Radiation Protection and Safety of Radiation Sources: International Basic Safety Standards. IAEA Safety Standard Series GSR Part 3 (Interim); 2011. 3. International Commission on Radiation Units and Measurements. Patient dosimetry for x-rays used in medical imaging. J ICRU 5(2) Report 74. 2005. 4. Servomaa A, Tapiovaara M. Organ dose calculation in medical X-ray examinations by program PCXMC. Radiat Prot Dosim 1998;80:213-9. 5. Tapiovaara M, Lakkisto M, Servomaa A. PCXMC: A PC-based Monte Carlo program for calculating patient doses in medical x-ray examinations. Helsinki: Finnish Centre for Radiation and Nuclear Safety. Report STUK-A139. 1997. 6. Webb S. The Physics of Medical Imaging. Boca Raton: CRC Press; 1988. 74-127. 7. Petoussi-Henss N, Zankl M, Drexler G, Panzer W, Regulla D. Calculation of backscatter factors for diagnostic radiology using Monte Carlo Method. Phys Med Biol 1998;43:2237-50. 8. International Commission on Radiological Protection. Recommendations of the International Commission on Radiological Protection. Oxford: Pergamon Press Publication; 1990. p. 60. 9. Radiation Protection Board. Ghana Atomic Energy Commission. Safe use of x-rays. Radiation Protection and Safety Guide: GRPB-G5. Accra: Graphicolor Ltd; 1995. 10. International Commission on Radiological Protection. Recommendations of International Commission on Radiological Protection. Oxford: Elsevier Science Publication; 2008. p. 103. 11. Muhogora WE, Ahmed NA, Almosabihi A, Alsuwaidi JS, Beganovic A, Ciraj-Bjelac O, et al. Patient doses in radiographic examinations in 12 countries in Asia, Africa, and Eastern Europe: Initial Results from IAEA project. AJR Am J Roentgenol 2008;190:1453-61. 12. Gyekye PK, Mensah CK, Emi-Reynolds G, Inkoom S, Yeboah J. Ovary and uterus dose assessment of female patients undergoing some selected radiographic examinations. IAEA International Conference on Radiation Protection in Medicine-Setting the Scene for the Next Decade, Bonn, Germany. IAEA-CN-192/102. 3 rd -7 th December; 2012. 13. Hart D, Hillier MC, Wall BF. National reference doses for common radiographic, fluoroscopicand dental X-ray examinations in UK. Br J Radiol 2009;82:1-12.